Two decades’ worth of The Year’s Best Science Fiction. The title is no idle boast. Anyone who follows SF and fantasy knows the names here, from ’60s veterans (Robert Silverberg, Ursula K. Le Guin) to today’s hottest names (Charles Stross, Ted Chiang). 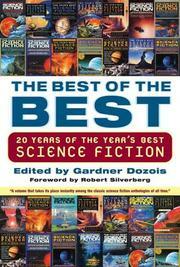 Among the Hugo and Nebula winners are Greg Bear’s “Blood Music,” Terry Bisson's “Bears Discover Fire,” Chiang's “Story of Your Life,” Joe Haldeman’s “None So Blind,” Connie Willis’s “Even the Queen,” Mike Resnick’s “Kirinyaga.” Even more of the stories were finalists for one or more of the genre’s awards. The volume is also a mini-history of short SF from the cyberpunk/humanist wars of the mid-’80s to the alternate history boom of the ’90s and the eclectic approaches of the youngest generation. Not surprisingly, Dozois was the original editor for nearly half the selections: his tenure at Asimov's Science Fiction Magazine shaped an era as clearly as John W. Campbell shaped the 1940s from the helm of Astounding magazine. But this is no self-promotional anthology; there are exciting tales from Omni, Fantasy and Science Fiction, and from original compendiums such as Starlight and Legends—a few were even originally published electronically. The tone ranges from ominous (Bear) to playful (Bisson), and the subjects are an epitome of the hot scientific topics of recent years, from genetic engineering to nanotechnology to fractal geometry and theories of dinosaur evolution. Dozois’s knowledgeable introductions put the pieces in perspective for readers new to the genre. While one could argue that such and such a seminal story is omitted, or the absence of novel-length work misrepresents the character of the era, any attempt to assess recent short SF and fantasy will have to begin with this well-edited and essential anthology.